Trafficking Forum at the Water Resource Center in Vancouver, WA – Keynote Speakers were James Pond of Transitions Global and Linda Smith of Shared Hope. In addition to the speakers the event included six exhibitors from local organizations. The forum was a huge success and drew over 100 people and the local media including the Columbian and Koin Local 6. 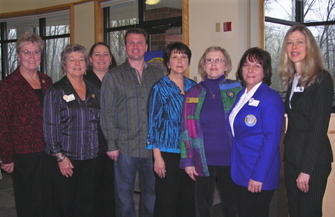 Although the first event was a success, the audience was primarily members of Soroptimist and their friends. The three clubs elected Bart to chair the next forum which ultimately took on a new identity known to many today as the Northwest Coalition Against Trafficking (NWCAT). Bart created and built NWCAT’s brand and began growing the program. The conference was moved to the Red Lion Conference Center in Jantzen Beach, OR and grew to over 300 participants from the public, 25 exhibitors and had national headlined speakers including CNN’s Jane Velez-Mitchell and United States Senator Ron Wyden. Following the 2010 conference, Bart and the committee asked for Soroptimist’s support and SI Northwestern Region joined the coalition as the project’s fiscal partner leading a way to two more successful years! In the summer of 2012 Michelle Bart, Carolyn Pillsbury and Debra Adams three of the original co-founders of NWCAT came together and the National Women’s Coalition Against Violence & Exploitation (NWCAVE) was founded. NWCAT will continue as the conference arm of the new non-profit under the National Women’s Conferences Against Trafficking. The mission of NWCAVE helps to inform, educate and prevent violence and exploitation against women and children nationally and internationally. Whether human trafficking, domestic violence, missing children, sexual assault, sexual violence, stalking, bullying, hate crimes and all other forms of violence and exploitation against women and children, NWCAVE strives to keep the public informed and educated on how we can live in a more civilized society free of violence. Today, NWCAVE is a volunteer operated non-profit 501(c)(3) organization located in the pacific northwest of the United States. We are licensed in Washington, Oregon and California where much of our programming and services are provided. The Board of Directors, National Leadership Directors, Our Founding Advisory Council and our National Media Ambassadors are all working together to continue the DREAM that the original program was founded on.